You’ve worked hard at school and college was fun but now it is time to make some hard decisions about your future direction in life. Shock, horror! It’s time to make a career choice. Teachers and parents have guided you thus far and you may well have had some thoughts of your own about what career to pursue. Throughout all that time you’ve spent in education you have been making decisions about what to study and you may or may not have had one eye on your working career when making those decisions. You’re about to start climbing the career ladder but first, you have to decide which ladder to climb. It may all seem rather intimidating or exciting at this stage and it is useful to seek advice and do some research. You’ll have a ‘gut feel’ for what you want to do but you need to consider ALL of the factors that will affect your decision; some will be more important than you realize and as time passes by that importance will change. One technique that can really help in weighing up all of your options is a Weighted Decision Matrix. It is very simple to use, makes you think, strips out some of the emotion in decision making and ultimately will help you to decide in which direction you wish to go. The first thing our math graduate has done is to write down his career options (Accountancy, Banking, IT, etc.). He is considering five different careers but the decision matrix tool isn’t limited and you could add as many different options as you like. Next, he has chosen five of the factors that are most important to him in choosing his future career (Salary, Training, Career Progression, etc.). Again, I have limited this here to five but it can be more or less as you decide. Possibly the hardest job comes next. Each of these factors has to be weighted. The higher the number you give it; the more important it is to you. Our math graduate has ranked Location/Travel as most important to him. I recommend ranking each factor between one and five. Try not to repeat a score, i.e. use the numbers one to five just once each. If you really insist that Training and Salary are of equal importance then that is fine but it may make the overall result less clear as you haven’t differentiated enough between the importance of each of the factors. 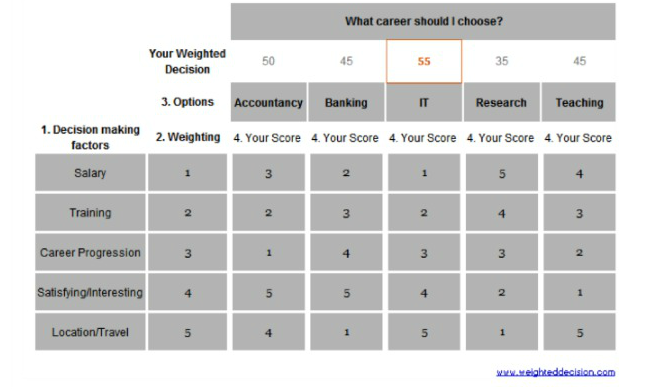 You now fill in the rest of the matrix giving a score for each career option versus each factor. Again, I would recommend using the numbers between one and five just once in any column for the same reasons as above. After all, it is decision time and you need to be strict with yourself. Once the matrix is complete the result is reached by multiplying the score in each cell by the weighting on that row. Each column is then totaled to give a final score. For example, the Accountancy column totals fifty which is the sum of (3 x 1) + (2 x 2) + (1 x 3) + (5 x 4) + (4 x 5). In this example, our math graduate has decided that IT is the career for him. As an interesting variation which can give even greater insight, you could ask people who know you well to complete the decision matrix on your behalf. Scores and conclusions reached by your parents, friends, and teachers may really surprise you but it will be in the discussion afterward that you may discover new things about yourself that make you think twice before setting off down any particular career path. 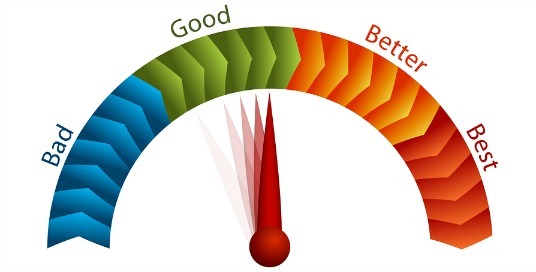 Why don’t you try the weighted decision matrix with your family and friends? Let us know how it went in the comments below. Mark Ford-Langstaff built the Weighted Decision Matrix website to help his family choose a holiday destination that kept everyone happy. He can’t stand long protracted discussions that go around in circles and likes the decision-making process to be as simple as possible. 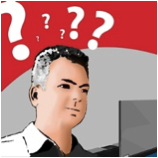 Thanks for the link to the online generator–nice quick tool! I’ve used them to pick a car, but they’re a great way to organize and communicate just about any decision (even gaming the weights for a desired outcome provides some clarity ;-).